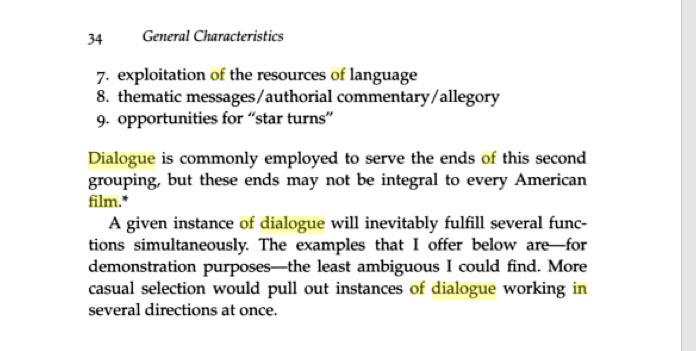 Importance of dialogue in film – Kozloff, Sarah. Overhearing film dialogue. Univ of California Press, 2000.
basic Film making- Edgar-Hunt, Robert, and Marland, John. Basics Film-Making 02 : Screenwriting. Huntingdon, GBR: Bloomsbury Publishing, 2009. ProQuest ebrary. Web. 8 October 2014. Basics Film-Making 04 : The Language of Film – Edgar-Hunt, Robert, Marland, John, and Rawle, Steven. Basics Film-Making 04 : The Language of Film. Huntingdon, GBR: Bloomsbury Publishing, 2010. ProQuest ebrary. Web. 8 October 2014. Routledge Key Guides : Cinema Studies: The Key Concepts (4th Edition) – Hayward, Susan. Routledge Key Guides : Cinema Studies: The Key Concepts (4th Edition). Florence, KY, USA: Routledge, 2012. ProQuest ebrary. Web. 8 October 2014. Film Sound: Theory and practice – Weis, Elisabeth, and John Belton, eds. Film sound: Theory and practice. McGill-Queen’s Press-MQUP, 1985. A place for film dialogue – Remael, Aline. “A place for ﬁlm dialogue analysis in subtitling courses.” Topics in audiovisual translation, P. Orero (ed.) (2004): 103-126. Look who’s talking. An analysis of film dialogue as a variety of spoken discourse – Taylor, Christopher. “Look who’s talking. An analysis of film dialogue as a variety of spoken discourse.” Massed Medias. Linguistic tools for interpreting media discourse, Linda Lombardo/Louann Haarman/John Morley/Christopher Taylor, Milano: Led (1999): 247-278. Narration in the fiction film – Bordwell, David. Narration in the fiction film. Routledge, 2013. Dialogue on Film: Gore Vidal – Alpert, Hollis, and Jan Radar. “Dialogue on Film: Gore Vidal.” American Film: Journal of the Film and Television Arts 2 (1977): 33-48. 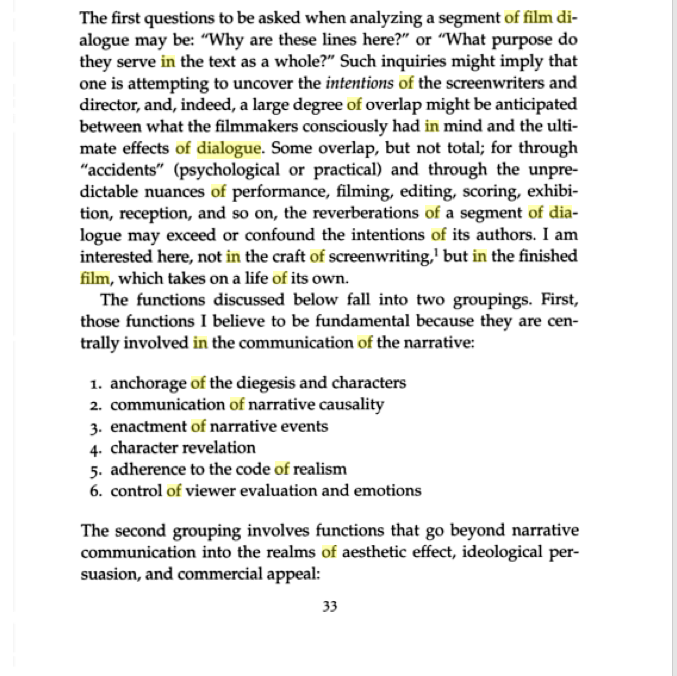 Story and discourse: Narrative structure in fiction and film – Chatman, Seymour Benjamin. Story and discourse: Narrative structure in fiction and film. Cornell University Press, 1980. Film dialogue. Jaeckle, Jeff, ed. Film dialogue. Columbia University Press, 2013. Mainstream Narrative Film Dialogue and Subtitling: A Case Study of Mike Leigh’s ‘Secrets & Lies'(1996) – Remael, Aline. “Mainstream Narrative Film Dialogue and Subtitling: A Case Study of Mike Leigh’s ‘Secrets & Lies’(1996).” The Translator 9.2 (2003): 225-247. Heartstring Short animation no dialogue. Shooting without a script: My living theory of shooting short films without dialogue. My living theory on shooting short films without dialogue looks to inform new filmmakers (like myself) on how relevant dialogue is to the core language of film. This dissertation, which will make reference to my newly finished practice by research film ‘Stanger’ (2015) will take focus on the topic of self-improvement within practice using action-research as the medium in attaining improvement as a filmmaker. short films and the viewer’s understanding of connotations and the core narrative of my film that contains no dialogue. I will explore how the use of other cinematic techniques can replace the verbal communication to an audience with a visual one and I will argue whether dialogue can show you that the camera cannot. My living theory on shooting short films without dialogue looks to inform new filmmakers (like myself) on how relevant dialogue is to the core language of film – with the main focus attending to the subject of the core languages of films. The silent era was the first exhibition of the new medium that was film which contained a coherent narrative theme. These silent pictures were proceeded by films like ‘The Jazz Singer’ (1927) and ‘Lights of New York’ (1928) that used dialogue to aid the story- but is dialogue really that important in conveying meaning in film? This dissertation, which will make reference to my newly finished practice by research film ‘Stranger’ (2015) will take focus on the topic of iconic films from film Auters including Alfred Hitcock and Andrei Tarvosky and their techniques with film making. Taking into consideration the viewer’s understanding of connotations and the core narrative of my newly finished film, that contains no dialogue. I will explore how the use of other cinematic techniques can replace the verbal communication to an audience with a visual one and I will argue whether dialogue can show you that the camera cannot. My aim is to observe whether I can attain my aim of improving my filming skills as a director through my approach to this practice as research/living theory project.